I was really excited to hear they were making a live action movie of Dragonball. Like most fans of the series, I always wondered what Dragonball would look like with real people. It’s just such a fascinating translation. What actor would suit Goku? How would they pull off his hair style? The thoughts rambled on. Fortunately, after much anticipation, a slew of teaser shots, snippets of video and tons of rumours, Dragonball finally hit cinemas. Now I’ll have to admit, although I watched Dragonball Z religiously, I never did watch much of Dragonball. I knew the basic outline of the story, which I picked up mostly from Dragonball Z, and various media scattered around the web. I do still plan to watch Dragonball when I have some time. Having said all this, I don’t think I’m unqualified to give a decent opinion of the movie. I didn’t go in with very high expectations, instead, I was expecting the movie to have good parts, and bad parts. I didn’t think it would be excellent, but, I didn’t think it would be crap either. A sober attitude that I think was lacking among the black and white mindset of the online community. Mind you, this isn’t just a review, but more a post-mortem. Offering suggestions parallel to the criticisms and praises. Be warned, this article contains spoilers. Dragonball starts out strong — barring some seriously cheesy elements — in the opening scene, with Goku training with his grandfather Gohan. Not only was the choreography creative, but the scene simultaneously introduced humour and character into the mix as well. 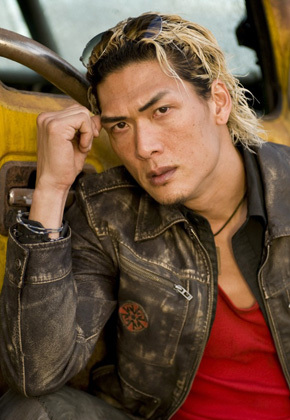 Goku’s character is then developed as the movie moves on to his troublesome life at high school. A social outcast, Goku is emotionally bullied and is unable to fight, due a promise he made with his grandfather. The whole social dynamic introduced at high school was really entertaining. Goku, while staring adoringly at Chi Chi, loses himself to a hallucination. You couldn’t help but chuckle at Goku’s grossly exaggerated imagination. A classic Animé moment which plays out brilliantly. The directors definitely didn’t hold back. I found myself — probably because I was subconsciously critiquing the movie as it played along — getting nervous that the scene would get cut short and not go far enough, thankfully, that wasn’t the case. Thereafter, some cool interplay between the shy Goku and confident Chi Chi. I laugh every time I see part where Goku tries to cope with Chi Chi’s confrontation, after he opened her locker using chi. Justin Chatwin acted so well in this movie. He made Goku such a likeable character. 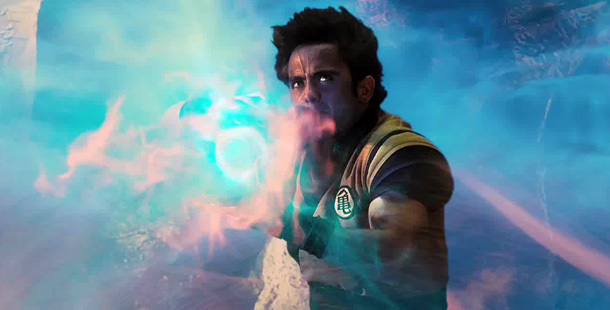 For someone who received so much criticism pre-launch of the movie, he really did an awesome job and makes a great Goku. Good job chap. It’s also worthy to mention that Jamie Chung (Chi Chi) was also good throughout the film. The previous two facts are made abundantly clear with Goku’s inevitable pair up with Bulma (Emmy Rossum) and Master Roshi (Chow Yun-Fat), who’s performances were less than stellar. Emmy tried way too hard in her role as Bulma. In her efforts to sound cool and “bad”, she put on a laughable and cheesy low tone of voice. Then Chow, forgivably mediocre throughout Dragonball, failed to bring Roshi’s eccentric nature to the film a couple of times. Then, then there was… Yamcha. Look it him, terrifying, isn't it? In retrospect, Yamcha plays a pivotal role in Dragonball, for he marks the decline of the movie. Yamcha was played by Joon Park, who failed miserably in every conceivable way imaginable. I gritted my teeth every time Yamcha reared his ugly head onto the silver screen. For the first five or so minutes of his appearance — which felt like an eternity — I was in shock. My mind was racing and I didn’t know what to do. I was panicking, and wanted to leave the cinema, but at the same time I was telling myself, “No, no, this can’t be happening, he’s going to ruin the entire movie. Maybe he doesn’t feature much”. Desperately grasping to any hope I could muster. From what had been a rather exciting experience up to this point, was being butchered by Joon. He failed in several categories as Yamcha. For one, he didn’t really look the part. He looks incredibly sleazy and creepy. I’m sure mothers everywhere hugged their daughters when he spoke his first line. Secondly — and most importantly — he epicly over-acted with a ridiculously put on voice. In fact, you will fail to come to terms with it. Unlike Emmy, his voice is not something you can overlook. As noted by my friend David, the only explanation for Joon’s voice acting is, that he really thinks Americans speak like that, “BODACIOUS. AWESOME. WHOA!”. Mixed in with a way too literal adaptation of the cartoon characters voice. Joon Park’s performance brings to mind many offensive internet acronyms. Specifically, WTFSTFUGTFO. This movie doesn’t say much for his acting ability (because there’s nothing good to say), but it doesn’t say much for the director, editor, casting director and sound staff either. How Joon got the OK without at LEAST re dubbing the movie, is beyond me. It’s amusing to me now to mention one of my least favourite scenes, which happens to come straight after Joon’s introduction. Coincidence? No. The freshly grouped band of adventurers, Goku, Bulma, Roshi and Yam$@! continued their quest to find the Dragonballs in hopes to stop Piccolo from making his wish. This lead to an necessary event, that happens inside the earth, where there was lava… yes, lava. It was here that my eyes were treated with terrible CG and a lacklustre fight scene that was very much a non-event. Which is what the poster and intro text should have read, because there really isn’t much to say about Piccolo, simply because he didn’t feature much. I wasn’t too phased by his looks, he just didn’t really feel otherworldly or mystical. Which is what Piccolo from the cartoon felt to me. The film fails to establish him as any real threat. I never feared him once during the movie. Simply stating he’s powerful and scary simply isn’t enough. The only point where there was a show of power, was when Piccolo crushed grandpa Gohan’s house. There was this other scene where he burned a village, but it was quite abstract and ineffective. In fact, as pointed out to me by a friend, Mai, his henchwoman, played a more pronounced role than the supposed “villain”. The portrayal of an impotent Piccolo was further amplified by the fact that Goku, with little training from Roshi — what was it, two days? — made quick work of Piccolo. Dragonball felt like it gained acceleration after the first half of the film. I was waiting for an epic finale battle between Goku and Piccolo that never came. They exchanged a few blows while being blatantly pulled up by cables “flying” in the air (they really need a new wire-fu guy). The moment came when Goku shouted the words I had longed to hear, “KAME-HAME-HA!”. Ending off with a “power struggle” that seemed to forget it was supposed to be a struggle. To make matters worse, they committed what I would consider blasphemy. Goku, not letting us relish in the moment of chi goodness, leaps forward towards Piccolo as unconvincingly as you can being pulled by wires, into his own Kamehameha, instead of being crouched with his feet digging into the sand, maintaining his beam. End. What a let down. I have to be honest with myself and say that there wasn’t even really a “fight” as it were. No cool moves, no Kung Fu. The best fight scene was at the beginning of the movie! I also found the special effects for chi a bit weak. As a friend put it — as you many have noticed, there was a lot of discussion about Dragonball with my friends after the movie had ended — all the chi / energy effects appeared way too wispy. There was not enough differentiation between techniques. Also, I’m not sure where this whole “air bending techniques” description comes from, perhaps Dragonball, but the Kamehameha as far as I know, was always a beam attack. Pure energy. I don’t remember it being multi-purpose either. It wouldn’t hurt the franchise if they created greater distinctions between the different techniques. This would then create familiarity with the viewers, who could then be psyched up when they see a trademark technique coming and can call it out. Surprisingly, there’s more to be said about this movie that I haven’t mentioned above. Although I’ve mainly focused on the bad, there were other good aspects. I liked Piccolo’s voice and really enjoyed the plot device they used to introduce Goku’s trademark hairstyle. Which I thought looked great. Initially, when I first heard about Dragonball going into production, Goku’s hair was what concerned me the most. It’s what makes Goku, Goku. It’s so distinctive and I’m glad they put the effort into it, and didn’t try “re visualize” it for the real world, like the movie industry does with so many fiction to live action adaptations. The crew also seemed to fix the scenes that were released on the internet during the movie’s production. All the complaints I had about specific moments in the teaser footage were edited and done differently (tastefully) in the actual movie. Watching Justin bring to life Goku’s little idiosyncrasies was a pleasure. Despite it’s flaws, I couldn’t ignore its merits. Dragonball was still a fun and an ultimately enjoyable watching experience. This entry was posted on Tuesday, April 14th, 2009 at 9:42 AM	and is filed under Animé, Film. You can follow any responses to this entry through the RSS 2.0 feed. You can leave a response, or trackback from your own site. I think for me, the worst thing about this movie was that they got so much of it perfectly right, perfectly Dragonball; yet somehow, they let enough of the movie degrade into weak American clichés, “power ranger”-esque non-acting and lackluster fight scenes. And for me, unfortunately these ruined the movie to a large degree. 70% of the movie was either good, or in some places excellent; but the remaining 30% was so terrible, so morbidly off-par, that they simply couldn’t be forgiven. That said, Justin Chatwin and Jamie Chung were superb. And for that reason, I still have hope for this franchise. Recast all the supporting actors, give the fight scenes some length and drama, and I think the next movie will be a total winner! Amen. Well said. Yeah, at the current level of quality, they are not ready to take a stab at Dragonball Z, but as you said, if they fix the sags and keep the highs it will be great. Daniel, the site looks great! Loving the sub title type! Thanks mate! Appreciate the compliments. Yeah, it’s currently my favourite typeface Gotham, by Hoefler & Frere-Jones. Mind you, nice article on the Space Needle on your blog. Those vintage illustrations of it are are insane. Also, I see you’re on Feedburner, I was thinking of signing up there, how you finding it? Thanks Natedawg, glad I could please a long time Dragonball Z fan. I must say, although I didn’t entirely hate the movie like you did, I can’t really disagree with you either. The beginning definitely gives you the feeling that things will start ramping up, but then never does. As you’ve said, we (fans) need an adrenaline rush, which is what I hope the Dragonball Z adaptation will bring. When I think of Goku vs Vegeta, I imagine dust, scrapped knees, desperation, all contained in an incredibly brutal fight scene. If (and I do mean “IF”)this movie ever gets made for a theatrical release, this will be the perfect opportunity to start over from scratch and do the series as well as the fans some justice. I’m talking total RETCON here. Replace the role of Goku and go with someone a little more credible. He doesn’t necessarily have to be established or well known for that matter, but at least “credible” for the character. That kid with the funny hair-do just wasn’t cutting it. He looked like someone who had a bad day at the hair dresser and should have asked for a refund. Part two is where you learn from the mistakes of the past and realize that this movie is all about the fans, and as fans wed simply ask for one thing and one thing only: stop trying to bring the cheesiness from the cartoon (which was endearing) to the big screen and give us a story that is plausible and has depth. It’s not just about the fights (although they make Dragonball what it is). It’s also about the heart of the character and how he struggles with maintaining his innocence and carefree nature in the face of true evil while coming into the powers of a demi-god. The episodes when Frieza wounded Picolo and killed Krillin, were the best scenes in the whole sage because we felt Goku struggle with that desperation, hatred, and rage as he was faced with hopelessness. When he finally did transform…CLASSIC! Give us that type of movie instead of trying to pander to promoting toys and other wack commercialism. Take a cue from the Wachowski brothers and the success they had with “The Matrix”. A film that initially had no big promotional advertising but turned out to be an awesome story that has gone on to cult status. One could see the passion that went into that movie before they lost their minds hollywood-style and totally screwed the pooch with the other two. Fans would love to see that same passion develop into a trilogy based on Dragonball Z as we see Goku finally fulfill his destiny and become a Super Saiyan. Stop trying to cram the entire series into a 2 hour frame and spread it out like Peter Jackson did with Lord of the Rings. Or maybe they should hire him to write the next script so it would really be worth seeing. Whoops. I didn’t see the reply asking about feedburner until now. I find that people are subscribed and using it for my blog but I think it really only helps you if you have a lot of traffic. I’m really not sure though. It may be worth a read online to see what the advantages are.